Today, I present to you a vegetarian dish with a simple list of ingredients. 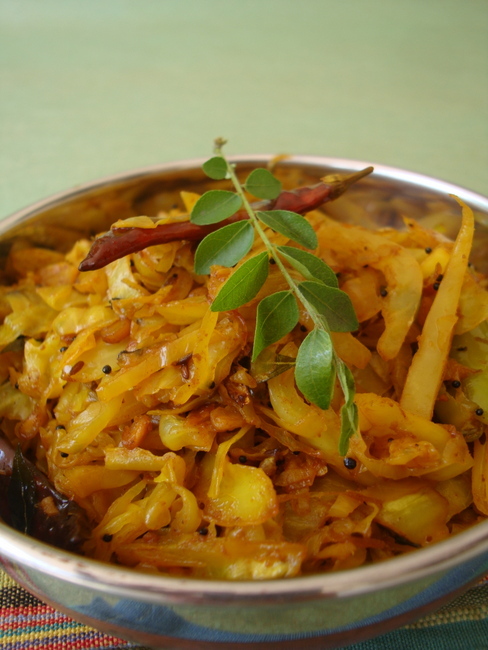 An Andhra style recipe, cabbage fry, that will not only nourish your body but will also please your palette. Did I mention that it is an easy to prepare vegan recipe that is sure to be relished by kids and adults alike. I served this stir fry with brown rice, tomato rasam, avakai (mango pickle), yogurt and papad. Made for a simple mid day meal. The left overs can be used as a filling for a grilled sandwich that will make for a quick lunch box or after school snack for your kid. Heat oil in a heavy bottomed vessel. Add mustard seeds and allow to splutter. Add cumin seeds and urad dal and allow to turn light brown. Add dry red chilies, green chilies, ginger, curry leaves, asafoetida and turmeric powder and saute for a few seconds on medium flame. Add the sliced cabbage and mix to combine well. Cook without lid for 9-10 mts. Lower flame, place lid and cook for 15 mts stirring once in a while. Remove lid, add coriander powder and salt and mix. Cook for another 5-6 mts and turn off heat. 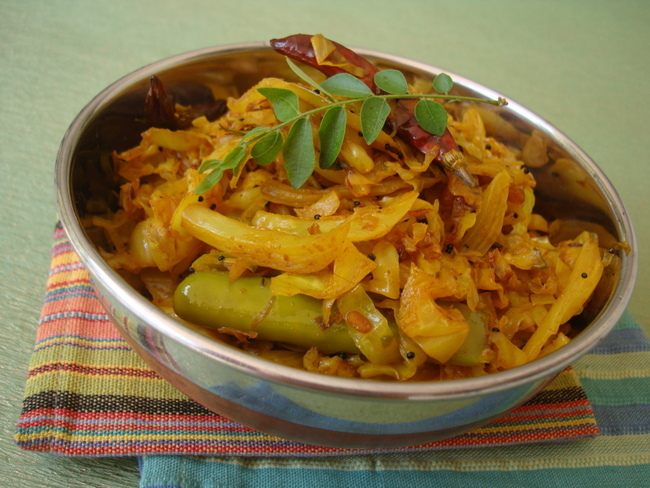 Garnish with chopped coriander leaves or grated coconut. Serve warm with rice or rotis. 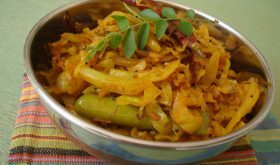 You can add grated coconut towards the end of the cooking process. For variation, add cooked green peas just before placing lid. By Sailu Published: April 18, 2012 Healthy and delicious cabbage stir fry that will not only nourish your body but will also please your palette. Did I mention that it is an easy to prepare vegan recipe that is sure to be relished by kids and adults alike. I served this stir fry with brown rice, tomato rasam, avakai (mango pickle), yogurt and papad. I also make with similar ingredients, but I cook cabbage 4 minutes in the microwave that cabbage color stays green and cook faster. Microwave kills the nutrition in the vegetable. For certain vegetables 70% of the nutrition is gone if you cook in Microwave. Which nutrients are lost in microwave? 70% or otherwise? Yes, that’s a great idea. The greenish cabbage is so tempting. Besides, most of the nutrients remain intact in microwave. My fav anytime..simply love it. Don’t see a print button. See lots of recipes that I like. Thanks so much. I too make almost similarly! Good one.. This looks amazing. I can’t wait to make it. At the time of adding curry leaves etc. Thnak you. This fry came out very tasty. I am REALLY SORRY for the mistake. The comment was in good intensions. I made this recipe for dinner last night along with basmati rice. It was delicious and easy and quick too. The whole family enjoyed. Thank you!